Cloverton Estate, located in Kalkallo in Melbourne’s North is set to be the largest urban development project in Victoria. Scheduled for delivery over the next 30 years, this estate will provide homes to around 30,000 residents when complete. Comprised of over 11,200 hectares, the site contains a rich landscape, including Merri Creek, and Bald Hill; an extinct volcano. Spiire was engaged to provide a vision for the site’s landscape. The brief was to design a destination playscape which combines site stories of both pre and post European settlement as well as aspirations for the future city of Cloverton. Artist’s impression, Merri Creek Park. Spiire, in collaboration with Heritage Insights worked with the Wurundjeri Elders to create a series of stories through play which reflected on the history of the site. Also included as part of this was an assessment of historical assets, and a cultural heritage management plan. As part of the main playspace design, our team was required to integrate the community’s Vision Centre, which features an eight meter observation tower overlooking the entire site. This incorporates a viewing platform, bespoke net climb to slide, and all-access toilet in an enclosed shelter structure. A large screen featured on the external entrance of the centre will be used for community outdoor cinema experiences in warm months. The Yam Daisy – a major source of food for the Wurundjeri has been used as inspiration for a water play and sculpture maze. Large metal fabricated daisies form the basis of the maze with water play controllable by a phone app. Developed by Spiire in collaboration with BigFish, the app allows the Cloverton sales team to control water play. The team can turn on and off the water play depending on patronage and specific needs such wheelchair movement. 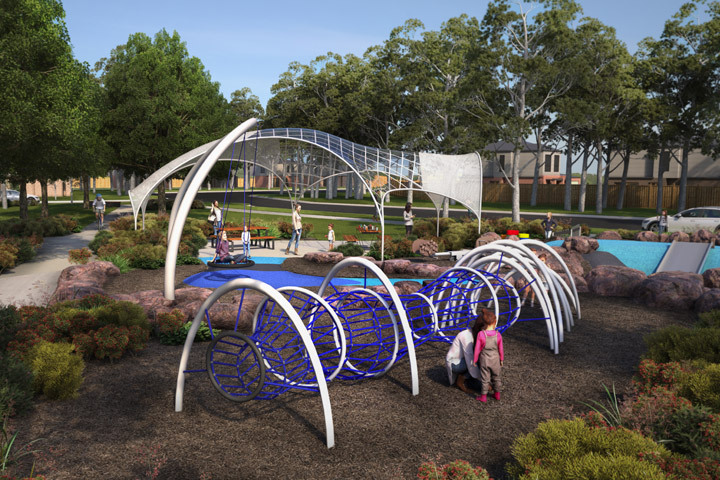 Once completed, Cloverton Estate will include an eel trap maze, a set of lomandra baskets, a yam daisy water play sculpture, flower pods and kangaroo grass sculptures as well as traditional play elements with a twist. Custom swings using kinetic energy will also provide lighting within the playground. The extinct Bald Hill volcano will be the feature of the next major playspace at Cloverton.